This Storey BASICS(R) title offers exactly what you need to know to keep your small farm's equipment in good working order. Long-time farmers Steve and Ann Larkin Hansen cover everything from tractors and mowers to trimmers, tillers, ATVs, plows, discs, drills, planters, cultivators, mechanical rakes, and balers, showing you how to care for your equipment to prevent problems and how to diagnose and fix the things that do go wrong. The invisible partner on a successful farm is smooth-running equipment. And to make that possible, you need good maintenance, the ability to spot and diagnose problems before they get out of hand, and the tools and knowledge to make basic repairs. In this beginner's guide, experienced farmers Steve and Ann Larkin Hansen cover it all. With their clear instructions and troubleshooting tips, you will save money on repairs and learn to safely operate and maintain your equipment so that it serves you for many years to come. 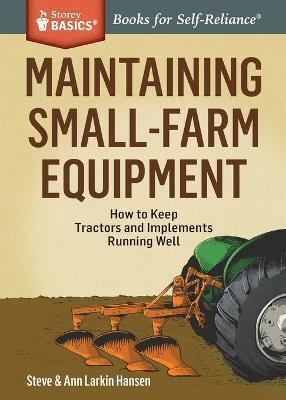 Steve Hansen is co-author with his wife, Ann Larkin Hansen, of Maintaining Small-Farm Equipment. The Hansens have run a family farm in Wisconsin for the last 20 years. Ann Larkin Hansen is the author of The Backyard Homestead Seasonal Planner, The Organic Farming Manual, The Electric Fencing Handbook, Finding Good Farmland, and Making Hay; coauthor of A Landowner's Guide to Managing Your Woods with consulting forester Dennis Waterman and master logger Mike Severson; and coauthor with her husband, Steve, of Maintaining Small-Farm Equipment. She has been a journalist for more than 30 years, specializing in organic agriculture and sustainable forestry. A homesteader and a small-scale organic farmer, she lives with her family on a farm in northern Wisconsin.